…we’re back! And we’re announcing two new shows! Join us 5/17 in Providence, RI and 7/20 in Jamaica Plain, Boston. And while we’re hard at work at on writing our sixth HTH LP, here’s two little tidbits to put on your next mix tape. These are original, instrumental tracks we created for the audiobook version of Astral Weeks: A Secret History of 1968. We had the pleasure of working with great musicians we grew up with in our headphones, like Tanya Donelly from Belly and Dana Colley from Morphine on this project. Parts of the hour-plus of music we recorded can be heard through out the audio version of the book, but here’s two tracks in full for streaming or downloading. For more information on the project, Vanyaland has the scoop. 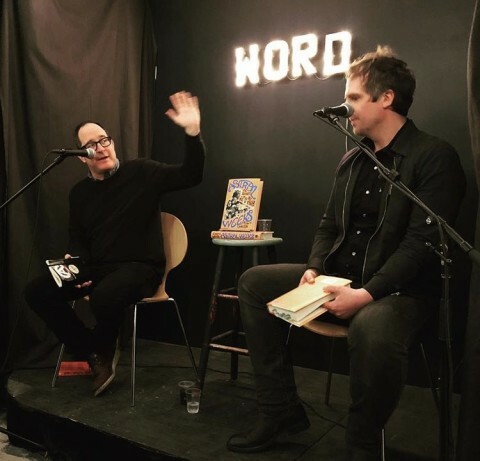 For the Brooklyn AW68 book event, Craig Finn from The Hold Steady interviewed Ryan for a great crowd that included Rob Sheffield, who recently wrote a comprehensive piece about the book for Rolling Stone. Besides being one of HTH’s favorite songwriters, Craig’s deep familiarity with Boston made him an obvious choice for the job. If you haven’t heard Craig’s last two solo albums, drop everything and fix that. These records are true gems of melody and storytelling, some of the most stand-out lyrics of the last few years if you ask me. Ryan appearing on Never Not Funny. Jimmy Pardo pronounces the band name correctly and Ryan performs “The 3 Minute Mark” solo. Longtime HTH supporter Aquarium Drunkard interviews Ryan about Boston and the book on their Transmissions podcast. Ryan interviews Patrick Stickles of Titus Andronicus to help unveil the band’s new LP A Productive Cough which is a surprising Stickles-Special® about the confusing times we live in, full of lifted spirits and real talk.